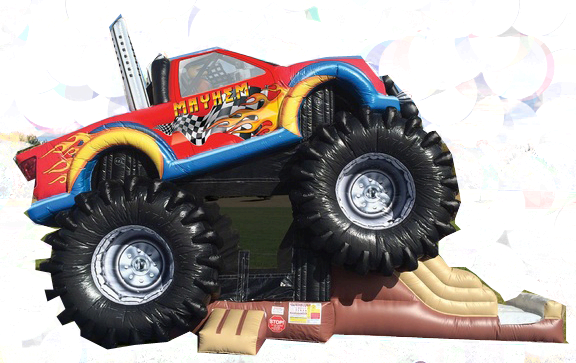 This is the most realistic Monster Truck Large Combo Bouncer your child could imagine. A full sized jumping area, climbing wall and slide. Bright and colorful graphic print. Life size tires at each of the 4 corners. It features an inflatable safety ramp at the entrance to protect excited kids as they scramble to get inside the bouncer. It also has large netted vent windows that keep things cool for the kids and allows parents to keep a watchful eye on all activities inside. Appox 6-8 users at a time.